Wheel loaders, also known as front-end loaders, payloaders or bucket loaders, are widely used in industries such as construction, agriculture, landscaping and forestry for numerous material handling and loading applications. Caterpillar® sets the standard for the heavy equipment manufacturing industry when it comes to wheel loader productivity and reliability — Cat® loaders always get the job done in even the most challenging job site conditions. You can also pair Cat wheel loaders with an assortment of work tool attachments for enhanced versatility and performance. Call us today at (317) 803-2526 for more info on wheel loader rentals. Looking for smaller wheel loader rentals? Visit MacAllister Rentals for small wheel loaders. 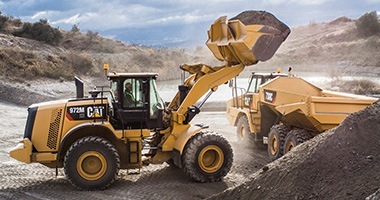 You don’t have to make a significant investment to experience the benefits of adding a high-quality wheel loader to your heavy equipment fleet. MacAllister Machinery carries an assortment of medium and large wheel loader rental units that offer an economical alternative to purchasing. As the heavy rental division of MacAllister Machinery — an authorized Cat equipment dealer since 1945 — we can help you find the ideal Cat wheel loader for your applications and budget along with the right attachments. Rent a wheel loader by the day, week, month or whatever works best your company. What Do You Get With a Wheel Loader Rental From MacAllister Machinery? A wheel loader rental will allow you to replace a broken-down machine that’s undergoing repairs. With our next-day (and in many cases same-day) service, you can keep your projects on schedule. It’s also a great way to beef up your equipment fleet if you’ve taken on a series of jobs or are anticipating an increase in demand. Many companies turn to renting to avoid machine ownership costs such as maintenance and storage. And a rental allows you to try out a piece of equipment before making a long-term purchasing commitment. 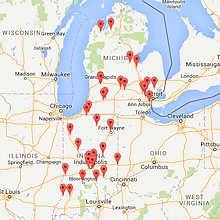 MacAllister Machinery has developed a reputation as one of the most honest and reliable equipment dealers in Indiana. We back every wheel loader rental with top-notch service and support every step of the way. No wonder so many companies in industries such as construction, forestry, mining, landscaping, agriculture and waste handling turn to us first whenever they’re in the market for a productive, dependable machine at a fair price. Browse our heavy rentals product guide to see our latest wheel loader offerings. You can also contact us online or give us a call for additional product and pricing information.